Summary: The City of Venice is requesting funding to install new 360 degree light shields on lights, identified by Florida Fish and Wildlife Commission and Mote Marine Laboratories, which threaten hatchling disorientation. 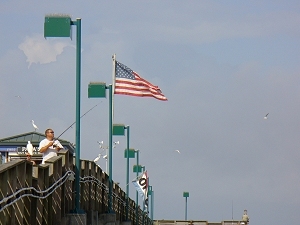 Florida Power and Light (FPL) public lights at the Venice south jetty parking lot, and Venice fishing pier lights will be retrofitted to minimize the amount of artificial light projected on to the beach while providing safety to residents and visitors. The goals of the project are to eliminate artificial lighting on the beach, increase public awareness of sea turtles, provide safety to residents and visitors, and reduce the number of turtle disorientations due to artificial lighting. Results: While nesting in the area was up, the disorientation rate for 2009 was also up by 11.2%. We believe next years report will more accurately reflect the shielding effort since the light shields were completely installed the first week of September where the season is starting to wind down. The highlights of the new lighting ordinance include new enforceable laws and specific approved lighting/window film for beachfront homes and condominiums. It is expected that the new ordinance will be adopted in March 2010. Mote Marine performed a light inspection on August 30th. Mote found that the fishing pier and jetty shields funded by this grant were functioning appropriately.